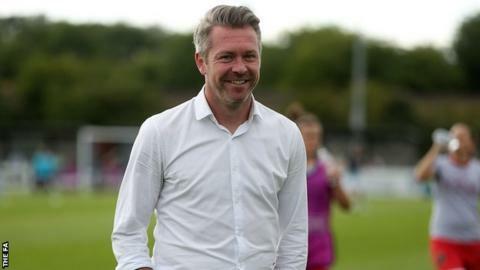 Bristol Academy boss Willie Kirk says a huge weight was lifted after beating Aston Villa in the Continental Tyres Cup to end an 11-match winless run. Tuesday's 4-0 win over the Women's Super League Two side is the top flight side's first victory since their Champions League triumph over Barcelona more than eight months ago. "It turned into a very big monkey, if not a gorilla," Kirk told BBC Sport. "You could see it was beginning to weigh them down a little." Caroline Weir, who joined WSL 1's bottom club from Arsenal on transfer deadline day earlier this month, opened the scoring at Sutton Coldfield on 27 minutes with an audacious 45-yard lob over Villa's Jess Myers, who was stranded off her line after giving away possession. Bristol Academy's victory over Aston Villa was Willie Kirk's first win as manager in the English game. It was also the first time captain Sophie Ingle has led the side to victory, having taken over the captaincy during the World Cup break. Caroline Weir's 45-yard effort to open the scoring was her first goal for the club since joining from Arsenal. Bristol keeper Mary Earps preserved their lead with two fine saves from Bethan Merrick after the break. Nadia Lawrence eventually added a second for Bristol before Equatorial Guinea striker Jade Boho Sayo came off the bench to score twice in three minutes to seal victory. "It is a huge moment," Kirk added. "Some players had never won in a Bristol jersey before and they had been here since January. "It was something that we were determined to get and it was important that it didn't turn into desperate to get. We hope to use it as a springboard now for the rest of the season. "The Continental Cup isn't a priority but winning a game was a priority. That could have been a game in the back garden and we would have been desperate to win that first game and get that monkey off our back."